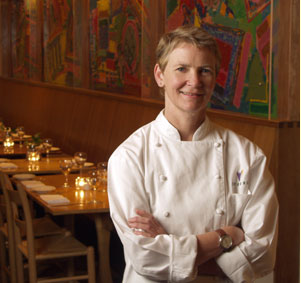 Annie Somerville, Executive Chef of Greens Restaurant, prepares some of San Francisco's finest vegetarian dishes. Located on the water with a stunning view of the Golden Gate, Greens is one of the City's premier fine dining establishments. Greens Restaurant got its start as part of the San Francisco Zen Center. How does that affect the menu choices and the overall atmosphere of the restaurant? To this day, there’s a wonderful community spirit at Greens. We’re a very public place, opening our doors to Greens to Go customers most mornings at 8:00. It’s a beautiful, relaxed setting, very calming much of the time. The dining room has wall-to-wall windows that look out on the Golden Gate and Marin headlands, and it takes you away from the stress of daily life. Greens paved the way for the vegetarian food culture as it is now. In what ways do you think the restaurant made headway in making vegetarianism mainstream? We’ve kept our vision. We’ve just kept doing what we’re doing all these years and we’re still doing it. 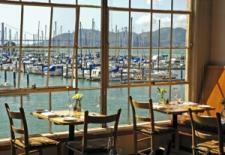 What sets Greens apart from other restaurants in San Francisco? We’ve been cooking delicious vegetarian dishes for thirty years in our beautiful Fort Mason setting, in the Golden Gate National Recreation Area, right on San Francisco Bay. We’re owned by the San Francisco Zen Center. When we opened in 1979, everyone working at Greens was part of the Zen Center community. So we’re owned by the San Francisco Zen Center, we’re in Fort Mason Center (a non profit center for education, the arts and the environment) and we’re in a national park! What sets it apart from other vegetarian restaurants? There are so many great vegetarian restaurants now. Our focus has always been on using beautiful, locally grown and produced ingredients and supporting people we know. What or who is the biggest influence in the restaurant's décor? Greens is an environment unto itself. The wall of windows that look out to the bay define the space. Our redwood sculpture and seating areas are totally unique. As a chef, who or what are your greatest influences? Farmers, cheese makers, olive oil producers, wine makers and any of the people who dedicate themselves to producing delicious food and wine. I love talking with home cooks about ingredients at the Ferry Plaza Farmers’ Market. I learn so much from people who love to cook at home. Our long relationship with Green Gulch Farm (Zen Center’s organic farm in Marin County) is a great source of inspiration. What would you say to meat-eaters who are visiting for the first time and may be skeptical about the lack of meat on the menu? Greens is a romantic place to eat. Most skeptics are won over by the bounty of the menu, and they tell their friends about us. Does Greens use organic produce? What is the policy there? We use as much organic produce as possible. Much is grown sustainably, by growers who use organic practices but are not certified organic. What is the standard policy on local produce? Where does most of your produce come from? Most of our produce comes from within 150 miles of Greens. Some of the farmers we buy from at the Ferry Plaza Farmers’ Market travel from the Central Valley so they’re further away. Do you have offerings for people who have food allergies, such as dairy or gluten? Yes, we do everything we can to serve guests with dietary needs. Gluten free meals are frequently requested and we’re able to accommodate the requests with brown rice, quinoa, polenta. We have lots of delicious wheat free choices. What would you say makes Greens a romantic restaurant for those sharing an intimate dinner? It’s such a beautiful place and the view is stunning. We've got a special dish for everyone, and we can arrange for the champagne and flowers to arrive at the perfect moment. Many couples have gotten engaged at Greens! Our biggest reward is when they return every year to celebrate their anniversary, then bring their children for family celebrations.